In web development you hear about accessibility (a11y) and how it's important, and at D2L, we pride ourselves on how accessible our platform is. Most of our platform is built on a couple of in-house frameworks which take care of a lot of "that stuff" for us. However, we've been moving towards, what we've dubbed, "Free-Range Apps", integrating semi-standalone web apps onto the page. This grants us a lot of freedom, and the ability to do a lot more than we could before. Unfortunately, it means we have to do a lot more than we did before. 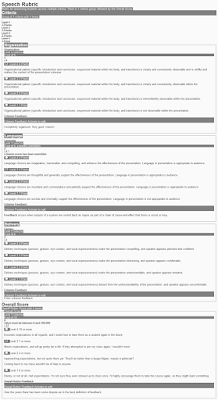 All the fancy titles, summaries, form control groupings, etc. that you could take for granted are now something that we all have to be think about. My team recently released such an app. We thought we'd followed "best practices", and would have something fairly easy to use from an accessibility standpoint. We had our resident a11y expert and tester, Carin Headrick, take a crack at it. Boy we were wrong. To those using screen-readers, I apologize for the tables. I use Blogger to run this blog, and its editor uses tables to attach a caption to an image. Rubrics are a common way teachers assess students and their work. 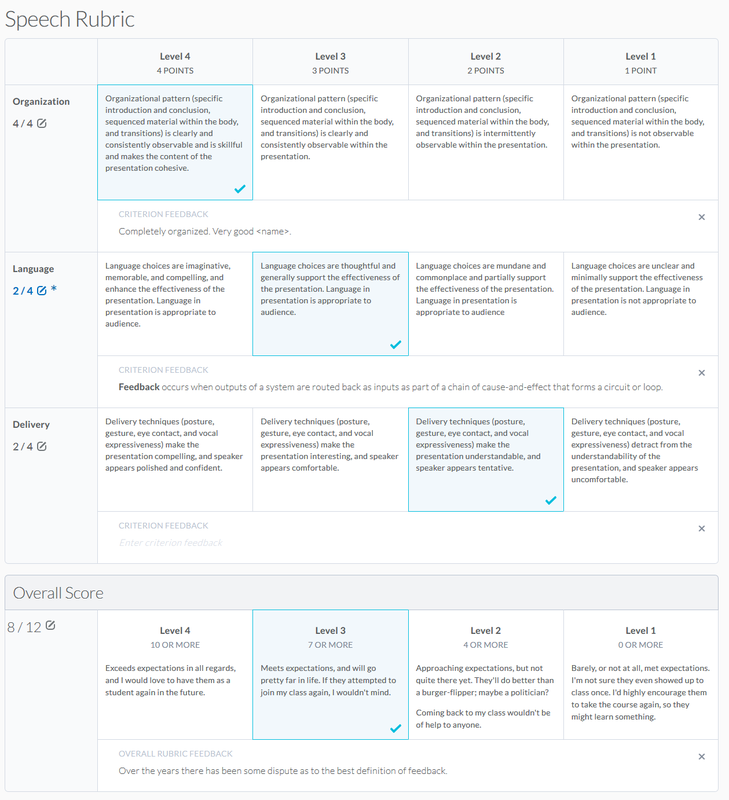 This is typically laid out as a grid, with some criteria to grade a student on, and several levels to choose from for each. This is something we've had in Brightspace for a while, but it's getting outdated and time for a refresh. Cue writing a new version as a free-range app. We spent a lot of time thinking about how it should function, what it should look like, and if it would support everything from the old one. There was some thought about accessibility, but not much. The consensus was, "there's no way we can be worse than the legacy one. Whatever we do, it’ll be better." Technically this wound up being true, but it still wasn't pleasant to use without a mouse and a set of eyes. Our original approach used CSS tables, admittedly because I wanted to play around with them. However, we started running into problems applying a colspan--CSS tables don’t support it--but thought it was tabular enough data that using HTML tables wouldn't be terrible. We used radio buttons to determine which levels were selected, thinking that would solve half of our a11y concerns. After a while of developing it, and fighting with table cells' lack of actual height or width, we were ready to ship. Now it was time to think about a11y. I installed NVDA on my machine, read up on how to navigate the page and tables, turned off my monitor, and gave it a try. Where we thought it couldn't be worse, we weren't wrong; we just weren't right, either. It was essentially impossible to use. 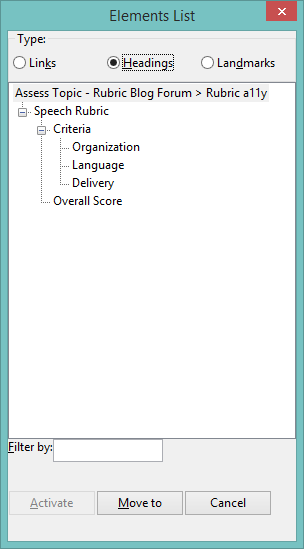 You could select a level, but it was difficult to tell which level was selected, or how many criteria, levels, or criteria groups there were. 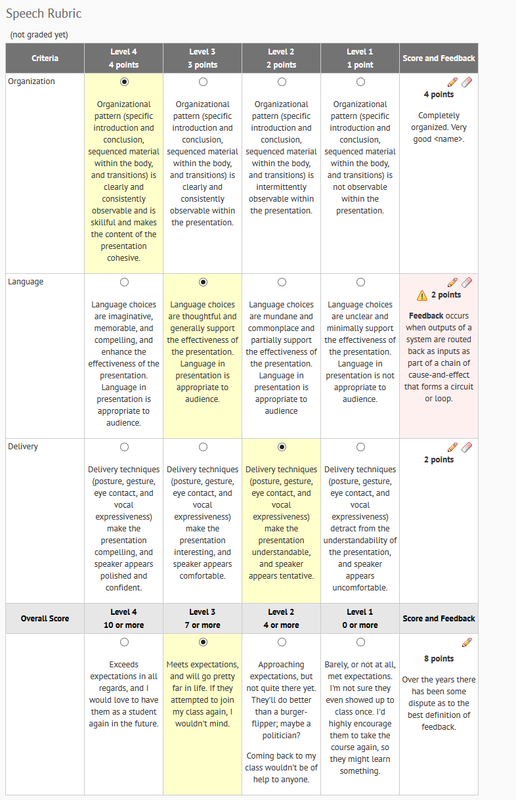 In analytic rubrics (your typical grid style) feedback spanning the entire row made column navigation impossible. 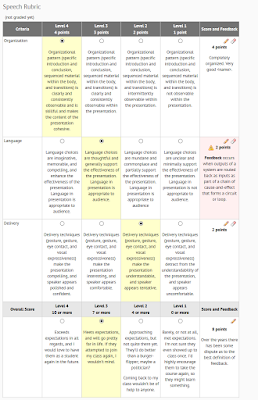 In holistic rubrics (only one level for the whole rubric) having radio buttons spread across rows stopped screen-readers from knowing that they were linked, and it was very confusing otherwise. At this point we decided to try fixing what we had. We knew a bit about aria-hidden for hiding things from screenreader, positioning things offscreen to hide them from visual users, aria-live to announce when things change, and tabindex to allow or prevent tabbing to elements. This was our toolbox. We would make this thing perfect. To start, I got rid of the radio buttons. Ironically they added more confusion than clarity.I instead added a tabindex to the table cells, which in combination with our on-click handlers, allowed you to tab through and select a level by hitting Enter. When it was selected, there would be a bit of offscreen text in the cell saying, "Level selected". After trying this with the monitor turned off, you could select a level but there would be no feedback that anything happened, unless you tabbed to the next then back. I added a bit of text to the beginning of the row to announce "Level three selected" when you selected a level, using aria-live="polite" aria-atomic="true". Other than an atomicity issue with NVDA, detailed further down, it worked! This also solved the problem of wanting to know what level was selected, since you could find this when you first entered the row. Although it no longer announces, this text is one of the few things that still remain after the rewrite. We found out that interactive elements should be able to be activated with the space bar. I used ngAria to make the spacebar work for anything with ng-click. Now it was technically usable, but still not a good experience, and the feedback editor was still nigh-unusable. We tried coming up with a couple of ways to partially redo what we had and make it work, but none of them panned out very well. During a further testing session I thought back to something our designer had come up with several months prior: field sets and radio buttons. A rubric doesn't have to be tabular. We'd convinced ourselves that it was, but only because that's how we've always seen them. 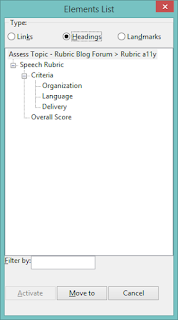 In reality, it's just a list of criteria, each with its own levels, feedback, and points. The table-like layout is just a convenient way to visualize it. With all of this in mind I decided to essentially start from scratch on our HTML, making it screenreader- and keyboard-friendly from the beginning, adding styling and a table-like appearance later. Fortunately we'd dropped support for IE9 about a month prior, opening up CSS flex layout for us to use. An early view at the "flat-form" approach. I started by taking our directive templates and wiping their HTML. I added field sets, radio buttons, labels, legends, offscreen text, and more, purposefully making things ugly as sin. I copied some HTML from the originals to aid in keeping Angular functionality, but ultimately rewrote most of it. This had the advantage of being able to focus on a11y, and not about altering the controllers or logic. After a little while it looked absolutely terrible, but it was quite usable. We had Carin give it a go, and she liked it! There were still a lot of work to do, but at least we were on the right track. 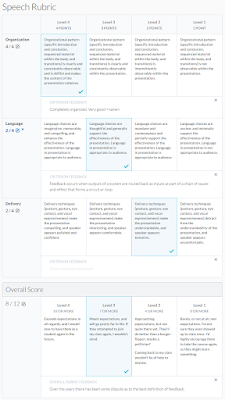 I took a bit of time to use CSS Flex layout to get a general rubric-like shape, and apply our existing CSS to make it look good. From here there was a lot of fine-tuning that went on, what we should do when the user performs an action, and how to actually do it. The biggest problem to tackle now was to make the feedback editor usable. It was a fair amount of work to get the best experience I could. There were some big easy wins, and a lot more smaller pieces that added a lot. I've tried to detail the interesting parts here, and most of the points should be relevant for anyone doing similar. I primarily used NVDA & Firefox, and JAWS & IE11 for any testing and development. 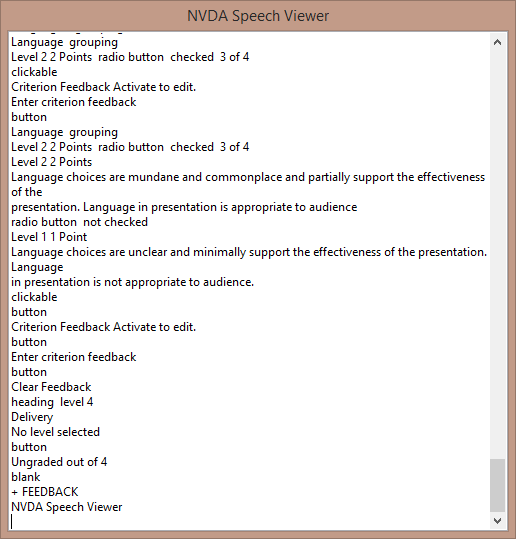 NVDA because it's free, and has a live-updated speech viewer, allowing me to listen to my music while developing. JAWS because, despite the price ($900! ), it's the screen-reader with the highest usage rate. I tried VoiceOver near the end of development, but didn't spend much time with it. I was physically unable to complete the tutorial without turning on the monitor, souring my opinion of it. I also gave Window-Eyes a once-over. When developing, I would focus on one or two things at a time, and try getting them right. I started with the easy things, then worked my way down to the nit-picky details. 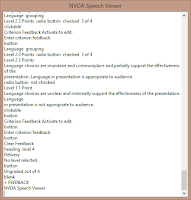 I'd typically have NVDA's speech viewer running to try things quickly. When testing, I would either turn off my monitor, or look away, and try using the rubric, paying attention to what didn't make sense, or where I'd get lost. Making a page navigable to someone who can’t see it, or needs to access it with nothing but a keyboard, is extremely important. In the large ways, this is easy to do. In the subtler ways, it took some work, and on occasion, some sleight-of-hand to get right. 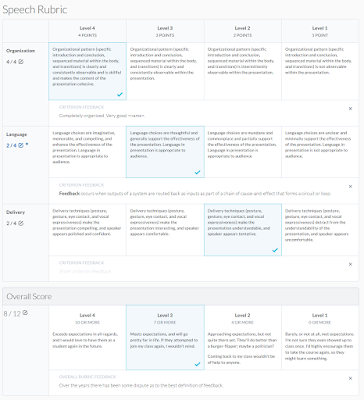 Level selection returned to having radio buttons inside labels, but with some improvements. This was, by far, the hardest part to get right. If you’re looking to create an accessible edit-in-place control, this should be helpful. Visually it’s easy to see what’s happening: Hover and it indicates that you can click; click and it gains a border and the usual text-entry cursor appears. When you click “Done”, or anywhere else on the page, it goes away. Reading the feedback is easy since it’s always on the page. This is a lot of information to portray to someone who can’t see it. Likely had to do with extra Angular watches we had around the contents. Didn’t investigate enough to be certain. Since this is very particular to our app, I’ll just detail what I did for these four cases. That said, some of it may still be relevant to something you’re working on. It’s not great, but it’s not terrible, and it solved the problem. 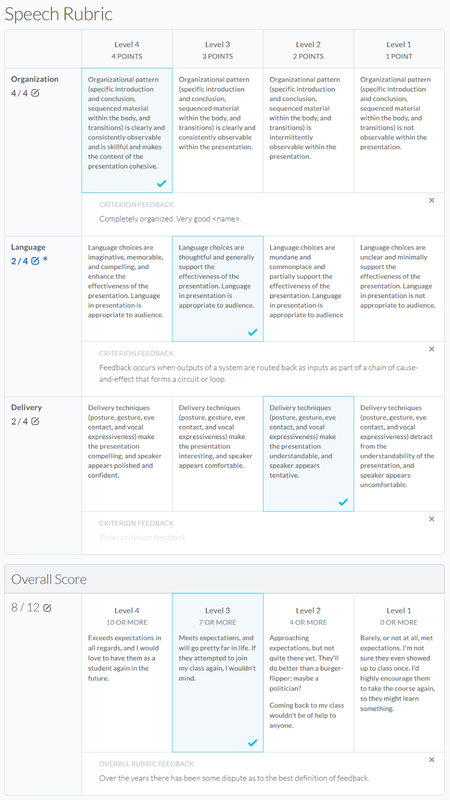 The same rubric with CSS removed. Anything you do in web development is going to have cross-system compatibility issues that have to be worked around. Screen-readers are no different. When clicking the edit-in-place button, the editor would be activated, focus moved to the end of the text, and the screen-reader was supposed to enter edit mode. NVDA would start editing if clicking the “Add Feedback” button, but not the edit-in-place control, whereas JAWS would. You had to hit Space or Enter to enter edit mode. Sometimes when editing feedback any moving around the page would start saying the page title, “JS App Loader Button”, and nothing else. Any tabbing, arrow navigation, etc. would have the same thing read out. 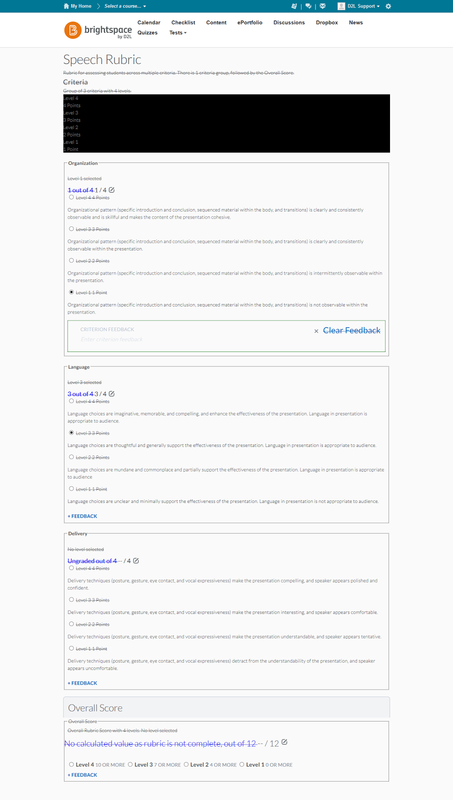 After editing the feedback and tabbing out, the user’s focus is moved to a “Done Editing” element. When the user tabs away from this it gets removed from the page, but nothing would be read out until they continue tabbing. After performing a feedback action, focus would be moved and an ARIA Live announcement would be read out to inform the user what just happened. JAWS would frequently not read the announcement at all, and NVDA would stop reading the newly focused element’s text with the announcement, making the user not know where they landed. When using aria-live you can optionally use aria-atomic=”true|false”. True will cause the entire text to be read out, false (the default) will only be the changed text. NVDA was reading out weird parts of the changes when non-atomic (eg: “Proficient” to “Partially Proficient” was read as “artially P”). When atmoic, it would occasionally read the whole text four times. Solution: Used a directive to emulate atomic changes that clears the text, then adds the new text a moment later. This directive made announcements in general much easier later on. Where is it? Where should it be? Does it make sense? Should what you’re focusing on really be able to receive focus? Is everything that should be focusable, focusable? There’s a lot you can do to make your page accessible, both to mouse, keyboard-only, screen-reader users, and more. 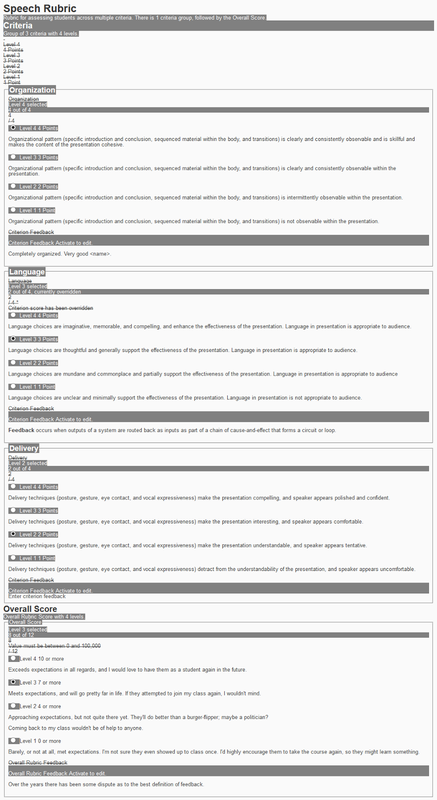 The W3C’s WAI-ARIA specifications detail a lot of what you should do, and they’ve release a nice WAI-ARIA Authoring Practices guide to help you out. I suggest anyone who’s looking to do web development at least skim the specs and practices, as you’ll learn a lot. The biggest things I learned from all of this is to consider accessibility as part of your basic design. Don’t leave it until the end of your project and hope it’ll just work. It may not be easy, or even possible, to make a perfect experience, but it’s worthwhile. While some changes may only benefit a small subset of your users, others will benefit all your users. If you have any questions or corrections, please leave a comment and I’ll try to address them.